Such was the subject of an email broadcast last week to the Ann Arbor Backyard Beekeepers. 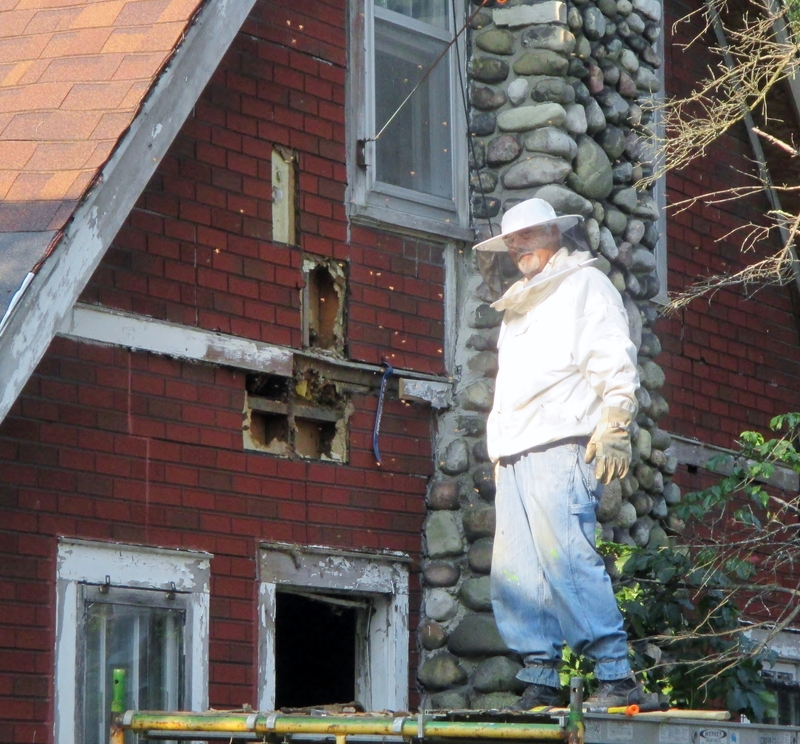 A house once occupied by a beekeeper had been left unoccupied (except by bees) for six or seven years and was now scheduled for imminent demolition. Recruits were being sought to help transfer the bees into Langstroth deeps to be moved to Matthaei Botanical Gardens, where they would be cared for as teaching hives. There was also a hopeful wish expressed for a battery-powered saw since there would be no electricity available. Since we possess a handy Milwaukee Hackzall and the house was not far away we volunteered for the mission. As the experienced know and the innocent can imagine, a cut-out has the potential for many a surprise. Until the investigation begins, one never knows which inaccessible cranny caught the colony’s fancy. Much ingenuity may be required. In that regard we were fortunate. Since the house was going to be demolished the day after cut-out we could be as destructive as needed without a care to fixing any damage we might cause. We arrived at the site nine-ish Sunday morning with our saw, a few ladders, and bee suits to join a handful of beeks of varying experience, most only a few years like ourselves. 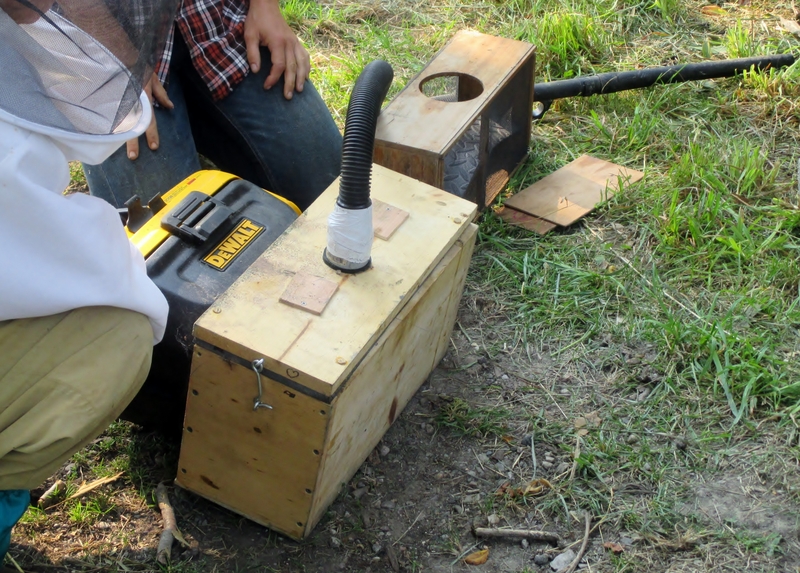 Dr. Milbrath was there to advise and coordinate and lend use of her bee vacuum bodged from a cordless DeWalt. 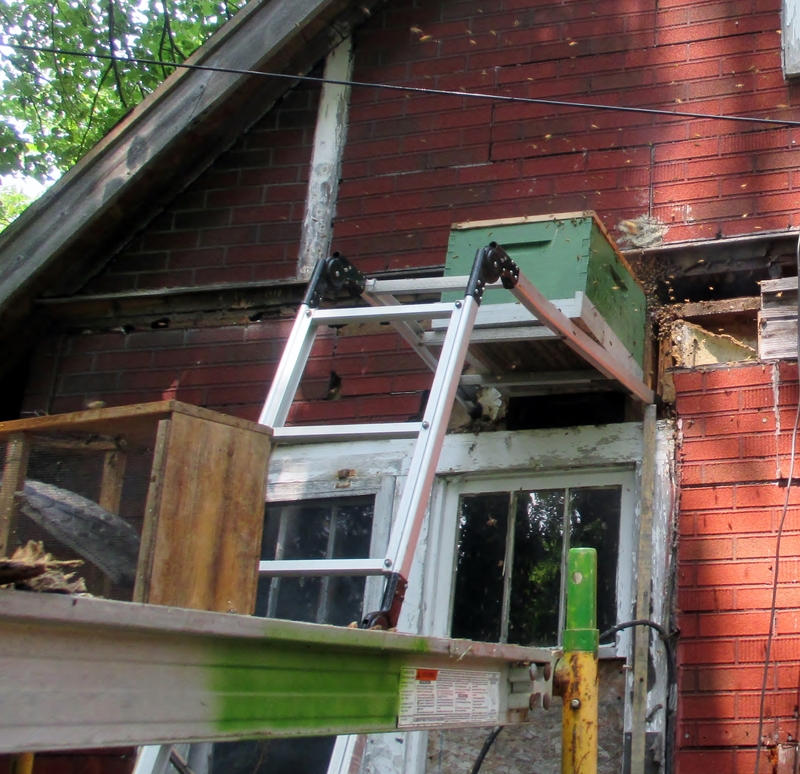 Preliminary reconnaisance had already been accomplished by tearing away the siding where the bees could be seen flying in and out. 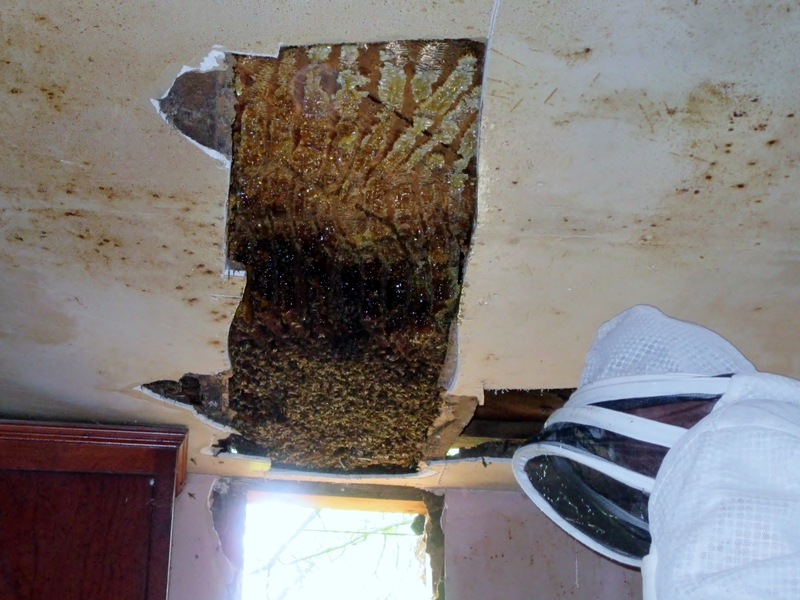 On one side of the house a seemingly small colony had neatly occupied the space between a pair of ceiling joists extending from the outer wall inward with no inclination to spread. A larger colony had done likewise on the other side of the house. Work began with the smaller colony so that we could all get a bit of practical experience before tackling the more populous one. The ceiling was cut away to expose the comb, most of which was surprisingly empty, and tracks where long-gone comb had once been. 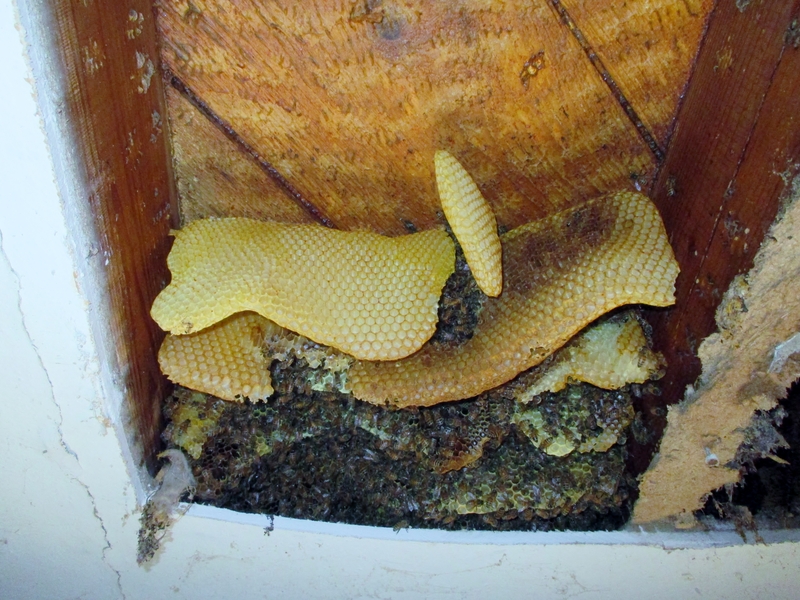 The bees were surprisingly unconcerned by our remodeling. While one can not be certain Dr. Milbrath theorized this might be a small swarm having only recently occupied the space left by a previous colony that had absconded. A bottom board was stapled onto each of the two Langstroth deep hive bodies we would be using. Carrying them up and down ladders and stairs would be awkward enough without trying to deal with a separate bottom board as well. The comb was cut away from the ceiling and floppily fixed in frames by rubber bands. Even before the process was completed a whiff of lemon could be detected. The bees within the hive body were accepting their new home and calling their fellows. To speed the process one sturdy soul climbed the step ladder to hold the heavy, comb-filled hive body directly below the former location of the comb, where bees were still clustered and milling about. A second beek went up the other side of the ladder with a bee brush and swept as many of the remaining bees into the hive as possible before the hive-bearer’s strength was exhausted. This process would have been even more fraught had the bottom not been stapled on. On the floor above, directly over the former space a hole was punched through the outside wall to make a new entrance. 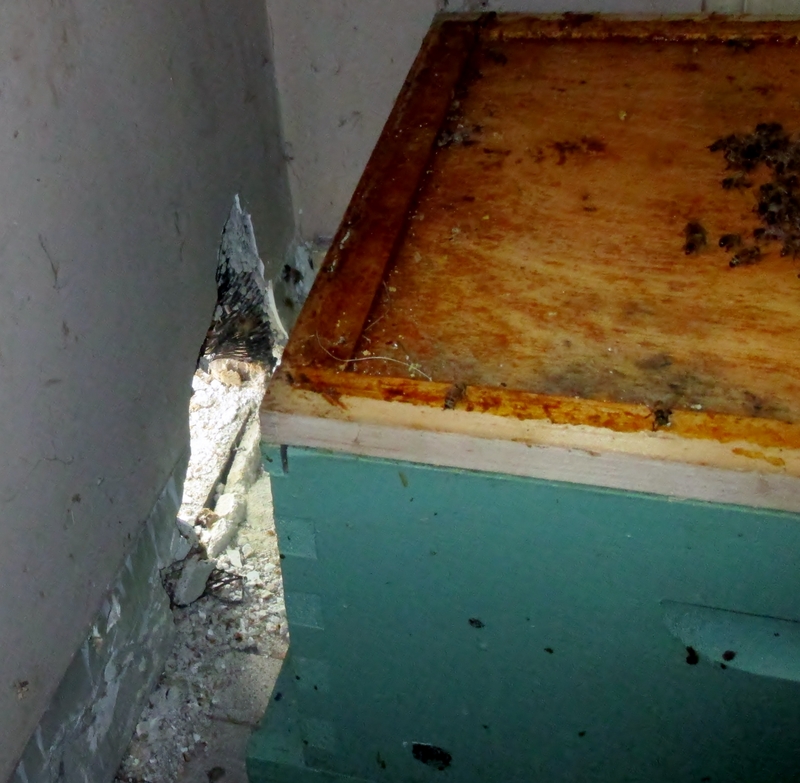 The hive, full of comb and with inner but not telescoping cover in place, was then placed on the floor facing out. The top of the inner cover was full of fanning bees calling their sisters through the new entrance and into their new hive. Unfortunately not all the bees heeded the call. An increasing number were returning through the original entrance to cluster where their comb had been. Some scent of home was apparently lingering on the empty boards. An attempt was made to herd the bees back outside where they might find the hole leading to the hive body by gently puffing smoke at them. Sadly it was not sufficiently gently done and the attempt failed. Rather than the more typical confounding of bees by filling the air with smoke this technique required them to be able to detect a clean-aired escape from the smoke if they went back out the old entrance to re-enter the new one above. In the end the bee vacuum was employed and some scrap wood nailed over the old entrance. The procedure was repeated with the second colony, much larger and with significant honey stores. The bees were somewhat more bothered as the scent of banana in the air indicated they were releasing alarm pheromone. They poured out of the saw cuts as soon as a pry bar widened them enough for a bee body. 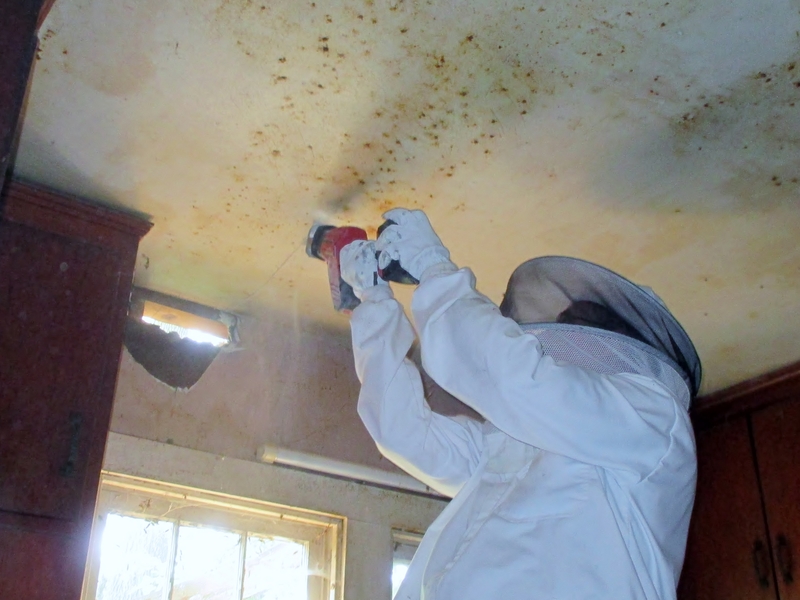 As before comb was cut from the ceiling, this time making a mess dripping honey onto beeks. 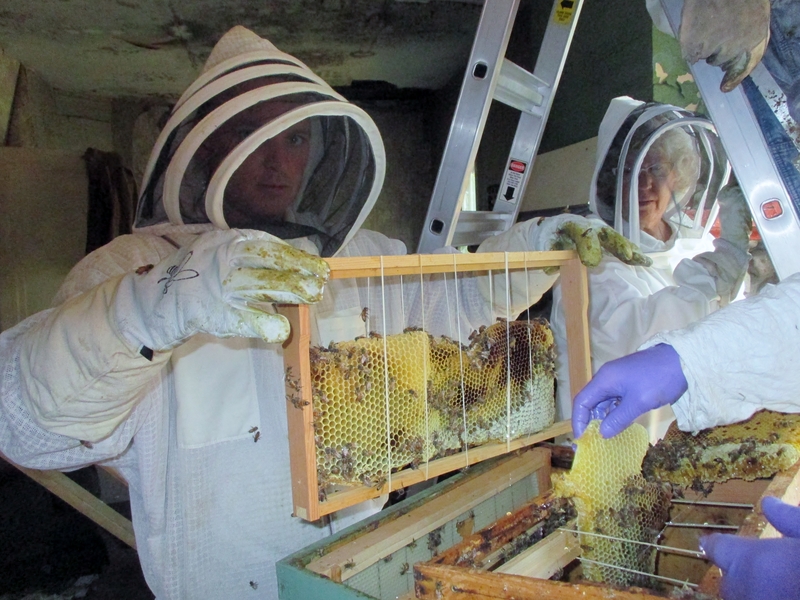 The brood comb was fastened into frames as before and the bee vacuum again deployed. The honey comb, however, was simply tossed into one of three five-gallon buckets. Honey comb is usually too heavy to be bound to a frame. Instead once the hive full of bees was in its new location the honey would be fed back to them by placing a completely empty hive body above the inner cover and the comb dumped in taking care only to not block the opening. By now it was noon and Dr. Milbrath had to leave to teach a beekeeping class. The rest of us broke for lunch before completing work on the second colony. Being so close we dashed home to return with a folding card table on which we served crackers, apples, cheese (aged cheddar and velvety St. Andre), a bit of salami, and a bowl of cherries. To wash it down we had iced water and elderflower lemonade. Beekeepers must keep up their strength. Returning indoors we finished cutting away the remainder of the honey comb and then putting the hive body full of brood in position to be found by returning bees. This time the hive body was placed outside the house blocking the old entrance. We used one of those three-sectioned folding step ladders that can be configured as a straight ladder, step ladder, low scaffold, or, as we used it, an upside-down L-shape. Bracing the short leg of the L against the wall resulted in a steep ladder topped by a shelf on which the hive body was placed. And so we were done at two-ish to wait until dark to allow all the foragers to return and get over their confusion at the new look of their homes. To while away the time we returned home where, with some trepidation for our beekeeper whites were filthy are honey spattered, quickly inspected our own three hives and uneventfully saw that all seemed well with them. We drove to Matthaei Botanical Gardens to catch Dr. Milbrath finishing her class so we could return some batteries she had left behind. By the time we again returned home it was late enough for supper, during which we watched an episode of Midsomer Murders, fortuitously one in which a beekeeping monk plays a part. We have not had a day so filled with bees since the last SEMBA conference. At nine thirty that night, when all or nearly all the bees could be assumed to be within their hives, the organizer returned to seal up the hive bodies and transport them along with the buckets of honey comb to Matthaei. We came back to assist and retrieve our ladder. Some unruly bees made this more exciting than we cared for after such a long day, finding gaps in the seals and our bee suits, administering a few final stinging insults, but we managed to contain them whereupon we returned home while they were chauffeured to their new location. And so ends the tale of our first cut-out, an intense, educational experience. Stings were acquired although nowhere near the number one might expect considering the destruction being wrought. We two collected five altogether. Between the accumulated dirt of abandonment, the raised dust of wrecking activity, and the steady drip of honey from overhead this was the filthiest and messiest of our bee-related activities to date as well as the longest we have had to stay suited up. And yet it had its moments of wonder such as holding a huge chunk of comb and feeling it vibrate in one’s fingers from the combined quivering of the bees riding it. 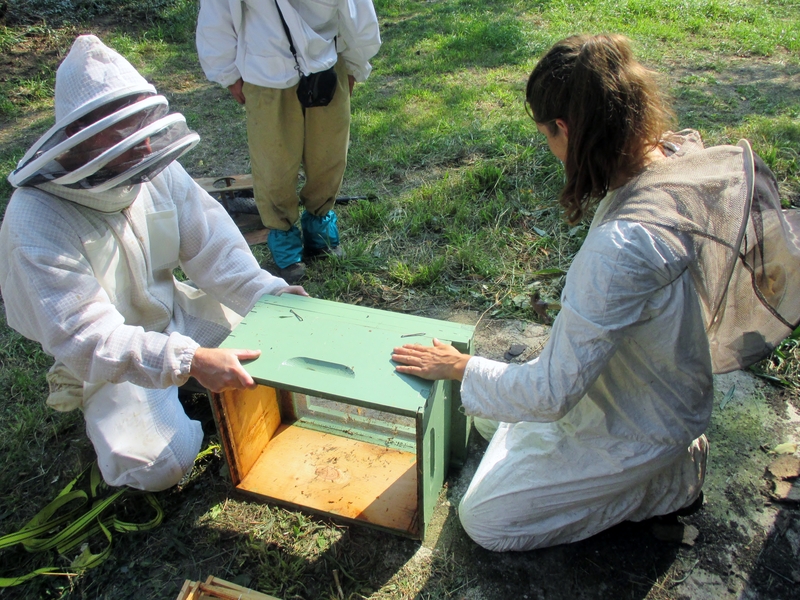 And, of course, we could feel virtuous for helping to save some bees. Wow! I seldom read a post this long but it kept me interested thru out–Exciting work, such a valuable & interesting adventure! Thank you. We did try to keep it as short as we could. If we have a chance to do something like this again we’ll probably just report “We came. We saw. We cutout.” Too bad that last does not begin with a ‘v’ in Latin. Nice going. That was a long day. I’ve yet to do a cut out. Having to wear full body bee suits all day is no fun…very hot. It’s very commendable what you’ve done. You gave up your day to save some bees that needed to be moved. That’s awesome. I hope to be able to do the same sometime. While it is true that we could have well used the time on other projects it is hard to regard our participation as a sacrifice. We learned too much and had too much fun. Good work. I like the sound of the refreshments, very important to keep your energy up for all that bee saving. Indeed, cut-outs are hungry work. Thanks! This is a sort of story I’ve never read before. Yay, bees! Most people not in beekeeper society are unaware of these kinds of maneuvers unless they are the ones owning the bee-occupied house. Great post, thanks for sharing all that detail. I volunteer at a local organic garden and some bees have set up house in the wall of an old shed. I may help another beekeeper catch them and put them in a more suitable home soon so I read with interest your approach. The bees I have to deal with live at waist height so it should be a piece of cake. 5 stings, that’s nothing – if you ripped up my house and caught my mother and sisters I’d go for you myself! We look forward to reading about that cut-out and will be quite pleased if anything we mentioned makes it go more easily. Wowie! That cutout looks like quite the job. I’m so jealous — it’s the stuff of my dreams. 🙂 Thanks for sharing that experience and your photos! We are glad you enjoyed our report and wish you the chance to experience a cut-out yourself. That was one heck of a job. You deserved a medal! Thank you. It was a long and tiring job, to be sure, but we gather it was fairly easy as cut-outs go.